A spice rack is an essential item in any home kitchen. It allows you to keep all of your favorite herbs and spices organized and within easy reach while cooking. Many of the revolving spice racks look attractive enough to leave on your countertop all the time while the wall mounted designs leave your work space uncluttered. These racks come in beautiful finishes such as wood, stainless steel, and chrome that will match any home décor, and many of them are quite affordable. You can use the following information to help you select the perfect one for your kitchen. The DecoBros Spice Rack Stand Holder comes in a chrome finish that looks amazing in any style of kitchen. It is just as at home in a retro 1950’s design as it is in today’s contemporary kitchens. You will get 18 glass bottles with this rack along with 48 spice labels. Each of the glass jars are 1 ¾ inches across and 3 ¾ inches tall while the rack itself is 13 inches long by 4 ¼ inches wide and 8 ¼ inches high. Your glass bottles arrive to you empty so that you can fill them with your own favorite spices. The pre-printed labels will make it easy for you to locate exactly which spices you need while creating your favorite dishes. The compact size of the rack makes it ideal for those who want to leave it out on the kitchen counter. It won’t take up a large amount of your work area, and it can just as easily fit inside of any cupboard for storage. This particular spice rack is manufactured by DecoBros. It is constructed of stainless steel with a chrome finish, and the entire piece, including the glass jars, weighs six pounds. It is not designed to be hung on a wall, but those who have already purchased this product have found they could hang it by using three picture hangers across the top of it. Store bought bottles of spices won’t fit on the DecoBros Spice Rack Stand unless you happen to choose a bottle that is the exact measurements of the empty ones included in your purchase. You can easily empty the contents of a store bought spice jar into the ones that come with it. This ensures they will fit securely on the rack. Online reviews show that people are quite satisfied with this product. They like that the jars are glass instead of plastic. They are durable, can be washed, and will last a long time. The lids are made of plastic and painted to look like a silver stainless steel/chrome finish. Each jar also includes an optional sifter cap that fits under the lid. This makes a simple task of shaking the spices on to your favorite foods. Many people love the wider opening found on these jars. You can easily fit a teaspoon size measuring spoon into it. This eliminates the need to redundantly scoop out several smaller ¼ or 1/8 teaspoons in order to achieve the desired measurement that your recipe calls for. The home cooks that found they use more spices than this one rack will hold state that you can stack a second rack on top of it. The sturdy construction won’t bow from the weight of the filled jars, and you can remove one safely without knocking all the others off of the stand. 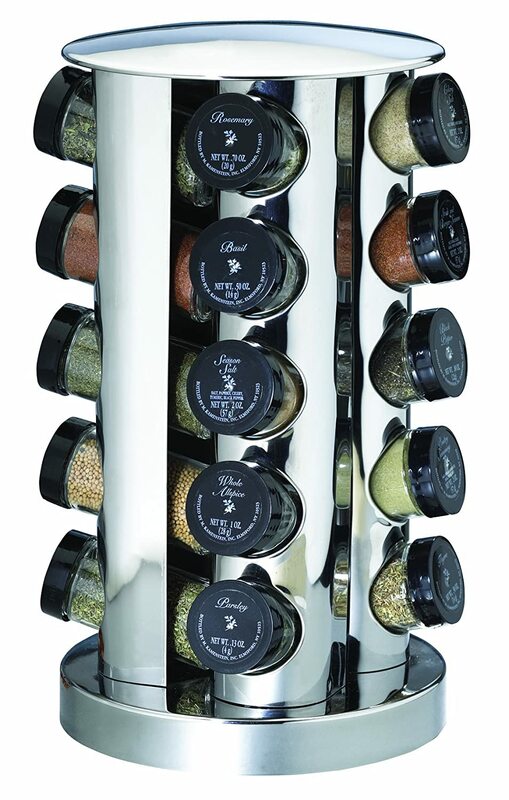 The DecoBros Spice Rack is ideal for anyone that buys their spices in bulk. It offers them a way to easily organize the spices into usable containers that are simple to handle. Best of all, this rack is sturdy, and it won’t move about on the countertop when you try to remove a jar. Rubber feet are found on the bottom of the stand. They help to reduce the risk of sliding or wobbling. Each jar will hold approximately three to four ounces. Several online posts comment on how the jars have not broken when they accidentally drop them. Although their glass construction is certainly capable of breaking, they are made to withstand normal kitchen use. The Olde Thompson 16-Jar Revolving Spice Rack Tower looks attractive, and it comes stocked with all of the most commonly used spice. It holds 16 glass jars topped with stainless steel caps. Each cap clearly tells you exactly what spice you will find inside in black lettering. The jars have a beautiful round shape that adds to the elegance of the rack itself. The rack revolves so that you can quickly locate your herbs and spices. It includes a black base and a stainless steel finial that adds to its beauty. It measures 10 by 10 by 12 inches. This makes it compact enough to fit in any kitchen cupboard or cabinet easily. It can also be left on the kitchen counter where it looks more like a decorative item than the useful tool that it is. The entire piece weighs 5.8 pounds when filled. Each filled glass spice jar is sealed to ensure the freshness of the product. Olde Thompson has included all of the spices and herbs you reach for the most often when cooking. This includes three ounces each of the dill weed, cinnamon, coriander, fennel, Italian seasonings, ginger, herbs de province, oregano, marjoram, parsley, paprika, rosemary, sage, savory, and thyme. Each jar is three inches by three and one quarter inches. A flip top is included in the construction of the cap. This allows you to sprinkle on the spices as you would with a salt shaker. If you completely remove the lid, you can pour the ingredients out. The rack stands on a sturdy plastic base that won’t slip or topple over. Each spice jar is held firmly in place within a slot so that it won’t fall off as you turn the tower looking for your seasonings. All of the jars are refillable. 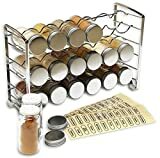 You can purchase more spices at your grocery store and empty the contents from their jars into the ones included with the Olde Thompson Spice Rack. You can also find these spices and herbs in bulk which will save you money. Most people love the unique design of this particular spice rack with round jars. It spins quietly and smoothly, and the spices that come with it are sealed and fresh. The biggest disappointment people had with the Olde Thompson Spice Rack was the fact that the names of the spices are printed directly into the cap’s surface. Many home cooks want the ability to customize their rack with their favorite seasonings. This problem was easily solved by purchasing separate spice jar labels to use over the printed names that come on the jar lids. 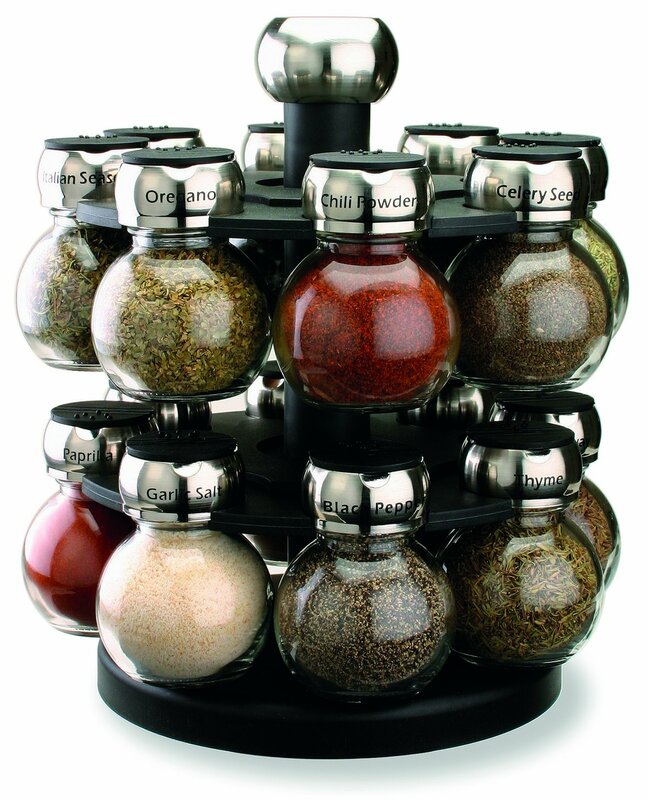 The Kamenstein 20-Jar Revolving Spice Rack Tower holds 20 of your most frequently used seasonings. 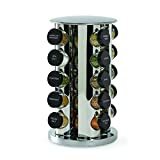 It has a beautiful stainless steel design that fits in nicely with most home decor, and it rotates so that you can quickly find the exact spice you need. The fact that you can order spices to refill the jars for free makes this rack unique. You will be able to get your refill spices free for five years by simply paying the shipping and handling charges. Each cylinder shaped jar includes a sifter top for sprinkling on your spices. The top will seal tight for freshness, and it can be completely removed to pour or use a measuring spoon to remove the contents. Each jar is filled in the Kamenstein facility and is FDA approved. You will need to register this product with Kamenstein through their website or by phone in order to take advantage of the five years of free refills. This rack is 8.2 by 14.2 by 11.3 inches, and it has a weight of 10.69 pounds when filled. The seasonings that are included with your purchase are bay leaves, coriander, fennel seed, rosemary, chives, dill weed, cilantro, savory, marjoram, thyme, oregano, parsley, herbs de provence, gourmet sea salt, crushed mint, season salt, Italian seasonings, pizza seasoning, and celery salt. Each jar is glass with a black lid. All jars fit snuggly on the rack. The rack will come to you already assembled with the jars filled. Many people love how the names of the spices are placed on the jars with stickers. Those who want to customize them with their own favorite seasonings can easily remove the current sticker and replace it with a label of their own. 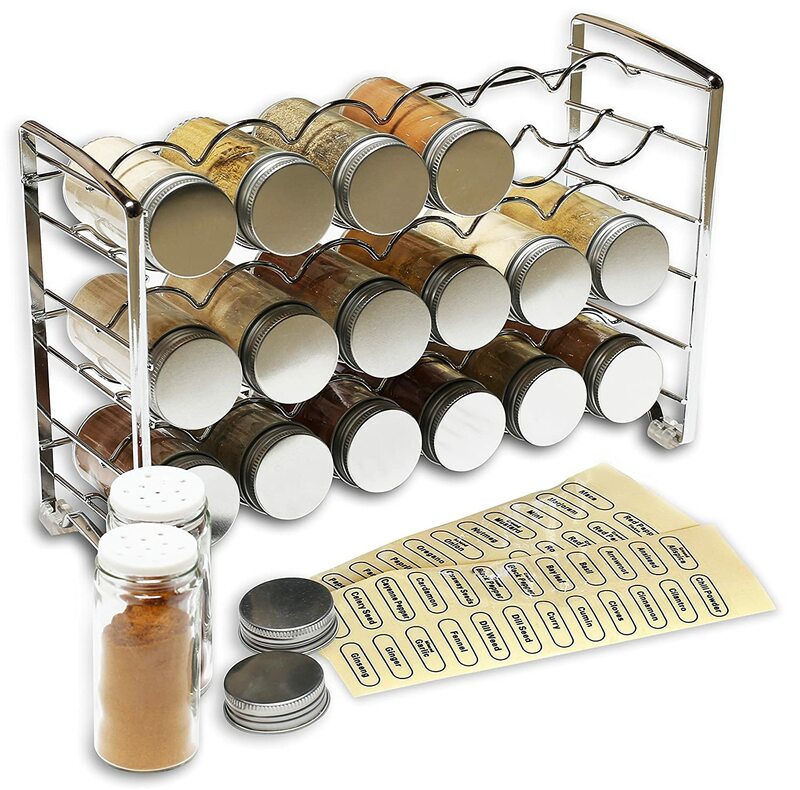 Replacement labels do not come with the Kamenstein Revolving Spice Rack, but they can be found online or in craft stores. Each spice jar is approximately three inches tall and one inch across. They hold three ounces. Those that have posted online reviews often comment on the convenient size of this particular spice rack. It fits nicely on a kitchen counter, especially under the cupboards. It can easily fit inside of a cabinet for storage as well. Many people enjoyed the free spice refills. Even with paying the shipping costs, it is still a fairly good value. They also liked that they didn’t have to search for the exact same spices in a store. It makes keeping the Kamenstein Spice Rack full a quick and easy task. Those who own this spice rack state that the spices you receive with it are a fresh and bright green. They also found the piece to be beautifully designed with an attractive appearance. It sits firmly in place, and it won’t tilt or wobble when you spin it. Many people loved trying all of the spices that came with it. They said it allowed them to experiment with seasonings they would not have bought separately. It is also recommended as an ideal gift for anyone that is just starting out. If you are the type of person that simply wants an easy way to store their existing spices, the DecoBros Wall Mount Spice Rack is for you. This is your basic, single tier spice rack that can be mounted to your kitchen wall or to the inside of your cupboard door. If you are placing it on the back side of a cupboard door, make sure the mounting screws won’t break through the wood and show on the door’s face. You will be getting two of the chrome mesh spice racks. Mounting hardware is included, but you won’t be getting any spices or jars. Each shelf is 4.3 inches deep and will hold any jar or bottle that has a diameter of 3.4 inches or less. This allows you to store all of the spices you purchase at your grocery store while still in their original bottles. You will never have to mess with pouring spices into your rack’s bottles. It still gives you an attractive appearance, and it frees up your kitchen counters for other appliances and tools. Each individual tier measures 15.8 by 3.8 by 4.3 inches. The sturdy mesh construction has a chrome finish that looks terrific in any home kitchen. The two pieces weigh 1.34 pounds together. There is 14 inches between the two mounting holes on each rack. You also have the option of sitting the DecoBros Spice Rack directly on the counter. It still looks great, and it can be pushed snugly up against the backsplash in order to leave you plenty of work space on the counter top. Online reviews are highly favorable for the DecoBros Wall Mount Spice Rack. Most people found them to have plenty of room for all of their spices. They like that it will hold a variety of bottle shapes and sizes. Due to the ample room they provide, many people purchased more than one set. They have found them to be handy for many kitchen items as well as providing extra storage for loose odds and ends in the bathroom. Over all, they felt they were getting an excellent value for their money. The most likely place for your spice rack is the kitchen, but the problem is where in the kitchen. You don’t want a spice rack to be too close to the heat and moisture created by your stove. Other than that, just about any place is good. Many designs can be left out on the kitchen counter. These spice racks are often created to look pleasing to the eye as well as serve a purpose. A carousel tower can be pushed back into a corner due to its lazy Susan configuration, and those with limited counter space may want to consider a wall mounted rack. Cooks who use a wide variety of spices have a few options. You can select one large rack that will hold them all, or you can find a multi-tiered design with enough storage space for all of your favorites. Some people choose to use a few smaller racks scattered throughout the kitchen. If you are the type of home cook that uses only the basic seasonings, you will be quite happy with a smaller spice rack that only holds six to eight jars. You will want to measure the space you have picked out for a spice rack. Make sure that the product dimensions listed for any rack you are considering ensure that it will fit in that spot. For example, if you get a spice rack that barely fits under your cupboards, you may be scraping your hands on the underside of those cabinets every time you reach for a seasoning jar. 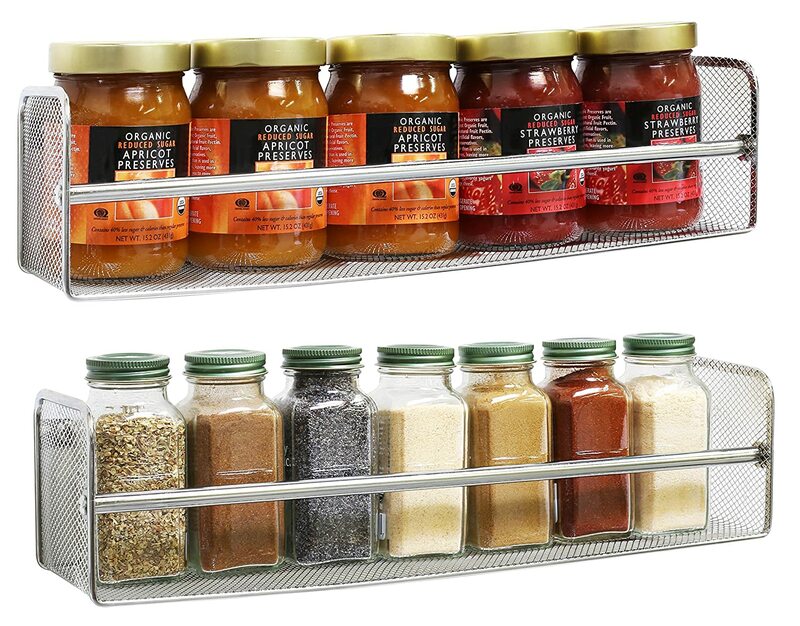 Allow ample room for lifting each spice jar out of the rack without hitting any obstacles. With or Without the Spices? Some spice racks will simply come with a set of jars that you have to fill yourself. Other models will include a full set of filled spice jars that include the most commonly used seasonings. You will also come across racks that are sold separately. These are designed to hold the bottles of spice that you would find in your grocery store’s baking isle. Keep in mind that a spice rack is supposed to save space. If you buy one that comes with the spices, you still need storage space for the jars of seasoning that you already own. Spice racks are designed in an assortment of materials. This includes acrylic, wood, stainless steel, metal, plastic, wire, and chrome. You may find that some racks will have a combination of two or three materials in it. Choose one that will match the décor of your kitchen. This is especially true if it is going to sit out on a countertop or table where everyone will see it. Make sure that the materials don’t obstruct your view of the spices and that it is easy to keep clean. Those who are looking for a customizable spice rack that they can use to hold their personal favorites will enjoy the DecoBros Spice Rack Stand Holder. It comes with 18 glass bottles and 48 labels so that you can see at a glance exactly which spices you have. If what you are really looking for is a decorative spice rack, the Olde Thompson 16 Jar Labeled Orbit is a true piece of art. Another great option is the Kamenstein 20 Jar Revolving Spice Rack Tower. This one stands out from all the rest due to its offer of free refills on all of the spices for five years, but if you merely want a basic shelf to hold the spices you already have, the DecoBros Wall Mount Mesh Spice Rack is a wonderful choice at a terrific price. All of these spice racks will help you organize your kitchen and make creating your favorite recipes a breeze.